In deep fryer or 3-quart heavy saucepan, heat oil to 375°F. In small bowl, mix sugar and cinnamon; set aside. In food processor, place apple pie filling. Cover; process, using quick on-and-off motions, 10 to 20 seconds or until pureed. Set icing from cinnamon rolls aside. Separate dough into 8 rolls; cut each roll into quarters. Fry in hot oil 1 to 2 minutes or until golden brown on all sides. Drain on paper towels. 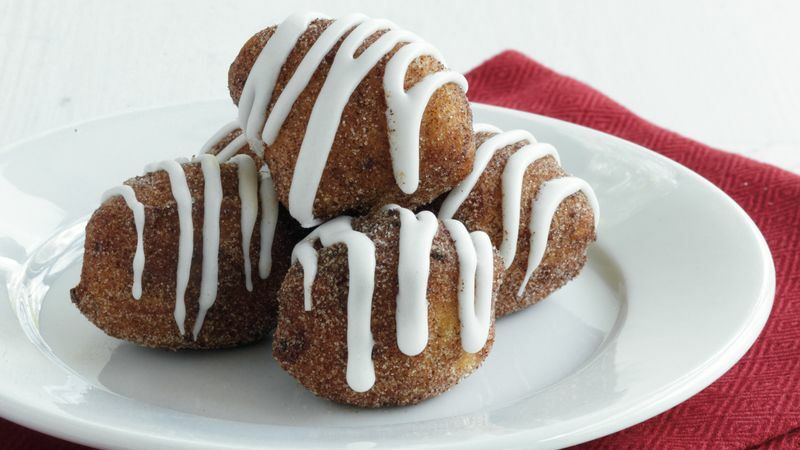 Immediately roll in cinnamon-sugar. Place apple mixture in decorating bag fitted with small round tip #10. Insert tip into side of each doughnut; pipe small amount of apple mixture into doughnut. In small microwavable bowl, heat reserved icing on High 10 to 20 seconds until thin enough to drizzle. Drizzle icing over doughnuts. Serve warm.